Sometimes you just gotta do things because you can, you know? It’s the sign of being a true gadget geek. Lets say you stumble across the Music application that comes built into the Motorola Xoom and other Honeycomb Android tablets — you’ve just gotta install that on an Android phone to see what happens, right? Turns out, it does some pretty cool stuff. XDA-Dev member WhiteWidows found an APK for Honeycomb’s Music app, Frankensteined it onto his rooted phone in place of the default app, and then popped into the settings menu. 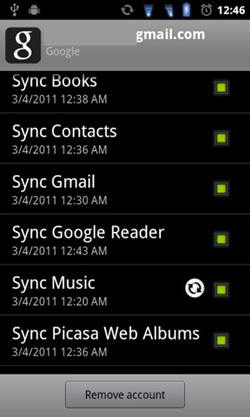 In there, he found a new option: Sync Music. He tapped the box, and let it do its thing overnight. Morning came, and sure enough: all of his tunes had been synced to some mysterious server in the cloud, and could be played back without issue. Even with a brand new, fresh SD card in the slot, his tunes played back no problem. Not bad for a service that hasn’t even officially launched, right?